Shortly, now, all of the internet– including Instagram— will be inundated with photos of everything that represents springtime. I don’t mind it, however. There’s something magical about the very first days of this season. I think it’s the feeling of relief after the expectation and anticipation for beautiful flowers, a fresh breeze, and the the sun encapsulating you in its rejuvenating blanket of light. Before getting caught up in the relief of winter being practically over, I’ve to share with you my blondie recipe– Nancy Drew Blondies from the book. It’s just necessary. 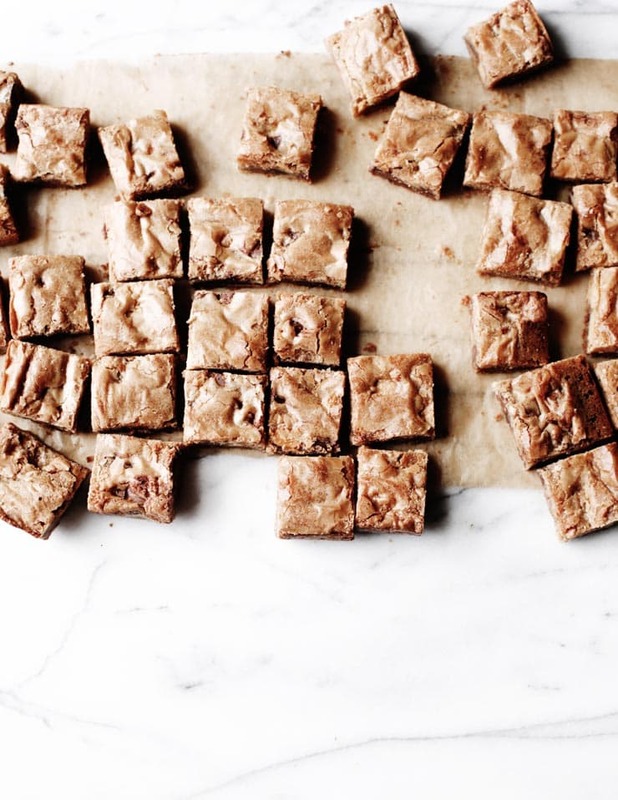 I’m keeping this post short, as my novel-sized posts are only meant for those moments when I feel rather talkative, and there’s not much to say about this blondies recipe other than: they’re just really good. After the book was published, messages of all kinds trickled into my inboxes with photographs of the the recipes people were holding dear to their heart. 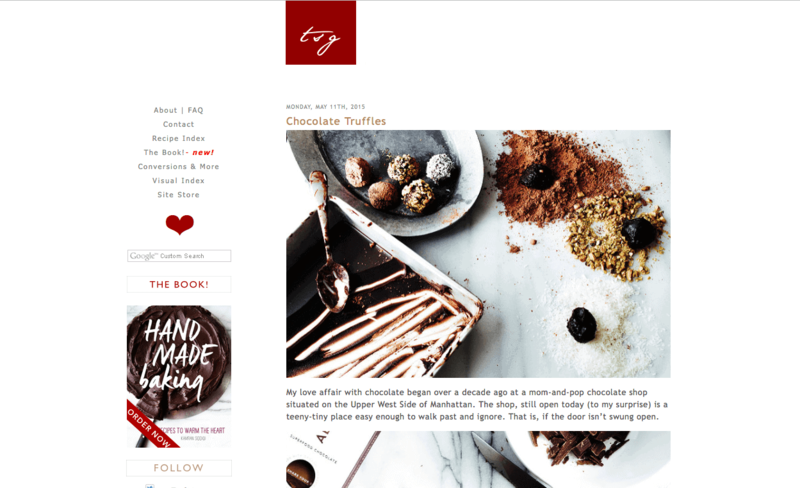 As expected, the chocolate recipes became huge hits. 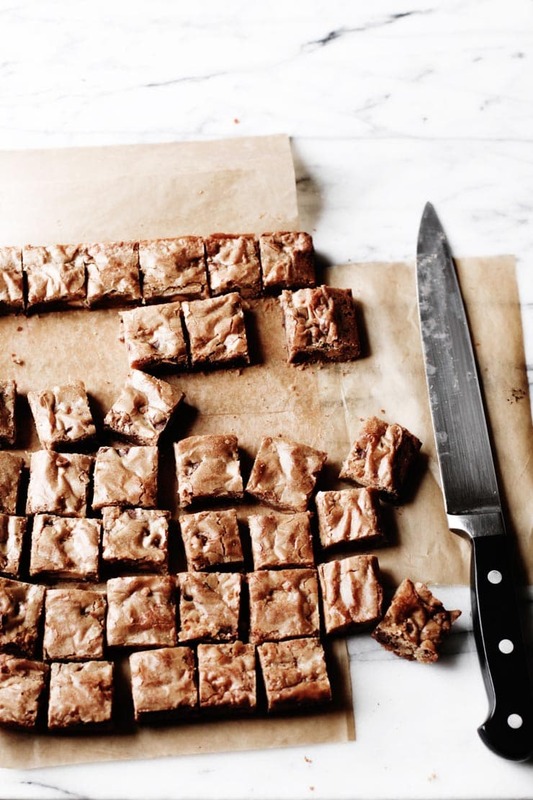 For the folks that loathe chocolate or lack the need for a dessert with a healthy amount of the stuff, the Nancy Drew Blondies recipe kept reappearing as one of the ones at top of the list. 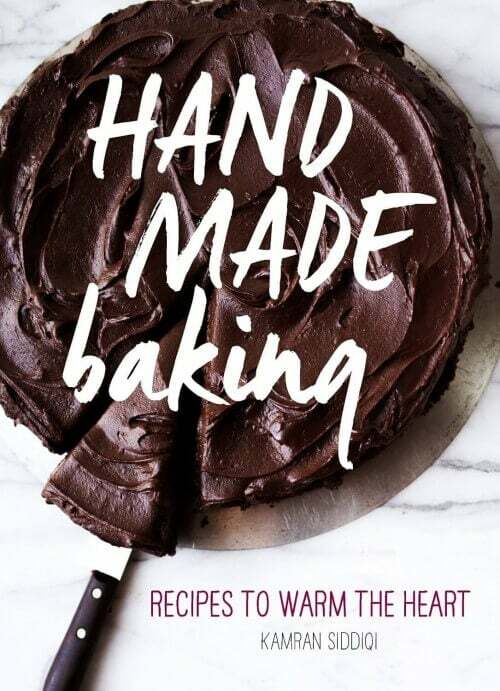 I’ll be the first one to say, if you have my book, you can never go wrong with a chocolate recipe– especially if you love chocolate. But in the case that you’re like my sister and mom, and prefer chocolate once in a blue moon, or if you’re in the mood for something different, these are the way to go. These blondies are rich, crackly-topped, taste of butterscotch, and they have the perfect indiscreet amount of chocolate which gets a bit swirled when stirred into the warm batter. These blondies got their name after the teenage detective in the series of novels, originally created by Edward Stratemeyer. The novels have been edited, ghostwritten by various writers under the pseudonym Carolyn Keene, and re-branded into various other series since first appearing in 1930. My mom read the original series of novels as a child; there’s not a lot of mention about blondies in the books, from what I’m told. In the movie starring Emma Roberts, anyway, Nancy Drew used these treats as a means of soft bribery– a kind of genius way of getting what she wants. The entire blondie recipe is no-fuss and very low-maintenance. It all comes together rather quickly in one saucepan and it’s perfect to make on a weeknight when you want to unwind after work and have a nice treat for the next couple days (or day, if you’re nearly as greedy as I am). As a quick side note: what do you think of the new site (this is the old look, for anyone that doesn’t remember)? I’m slowly churning out new features and updates to old pages, so click around and keep your eyes peeled (the book page was redone!). There’ll soon be nutritional information for all the recipes on the site, which I think is a helpful addition. Anyway, happy baking and let me know what you think! Makes:16 to 36 squares, depending on how greedy you feel. Recipe from: Hand Made Baking: Recipes to Warm the Heart, by yours truly. 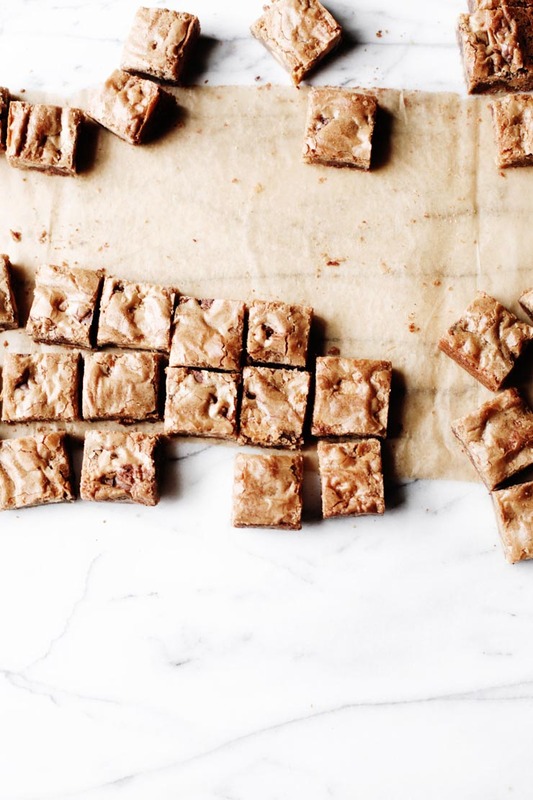 The original Nancy Drew Blondies are only flecked with walnuts. In the instance you’d like to go that route, please read the variation note below. 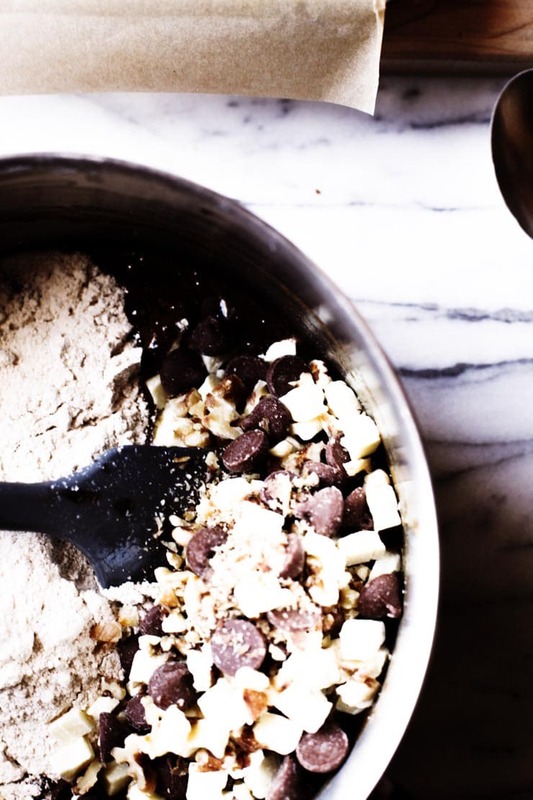 For those of that need more than that, go ahead and add milk chocolate chips and white chocolate chips into the batter (I always do)– the combination isn’t overwhelming and it makes for irresistible blondies. Feel free to chop chunks of white chocolate and milk chocolate from bars, if you prefer to use those instead of chips. Variations: This recipe is a good base for any additions that fit your tastes, so feel free to experiment after you’ve made the original recipe once or twice. 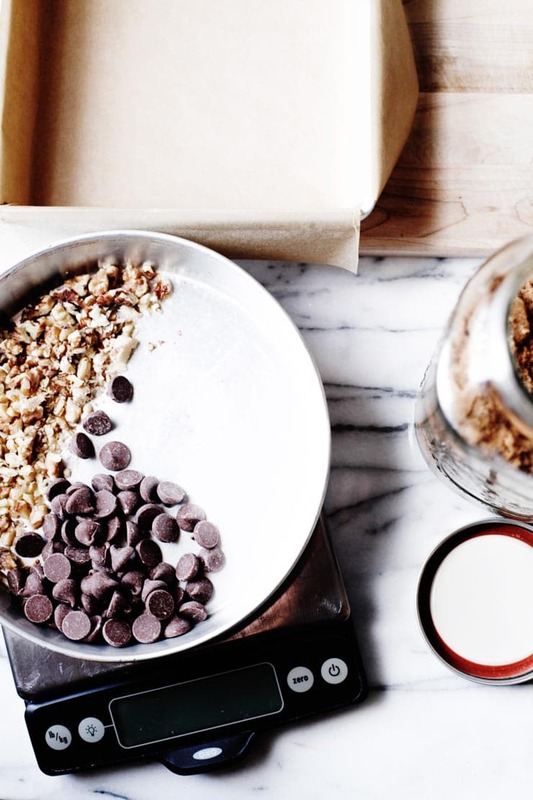 For example, if you’re not into white chocolate or milk chocolate, leave them out and increase the amount of toasted walnuts to 1 cup / 115 g. If you’re not into walnuts, feel free to use pecans or any kind of nut you feel might be appropriate. I’d avoid pistachios here, despite how much I adore them. For those that prefer blondies that aren’t on the sweeter, more delicately flavored side of the street, feel free to go with a good dark chocolate– anything with about 54% to 70% cacao solids, I’d say. 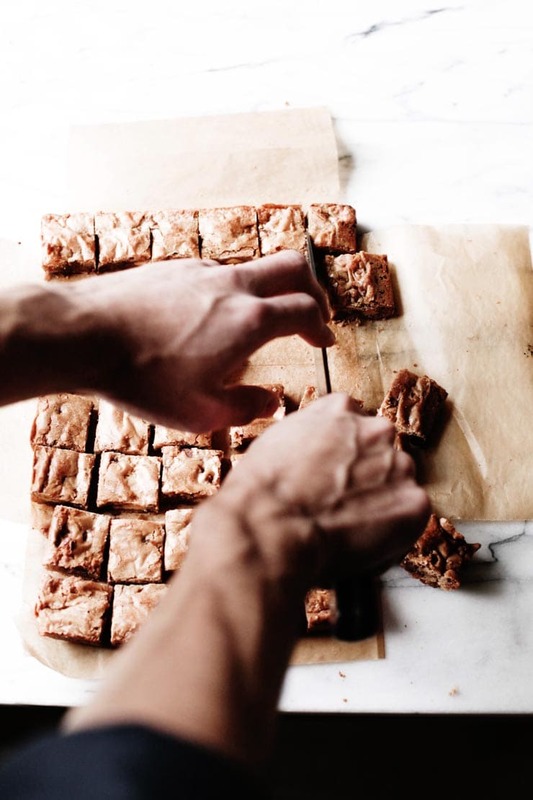 If you’re into it, feel free to top these crackly-topped beauties with a little crunchy Maldon sea salt or some fleur de sel to add a little more oomph to the blondies (as if they could get any better!). Alternatively, you can increase the salt in the recipe to 1/2 teaspoon. 1/4 teaspoon fine grain sea salt. Position a rack in the upper third of the oven. Preheat the oven to 350ºF/ 180ºC. 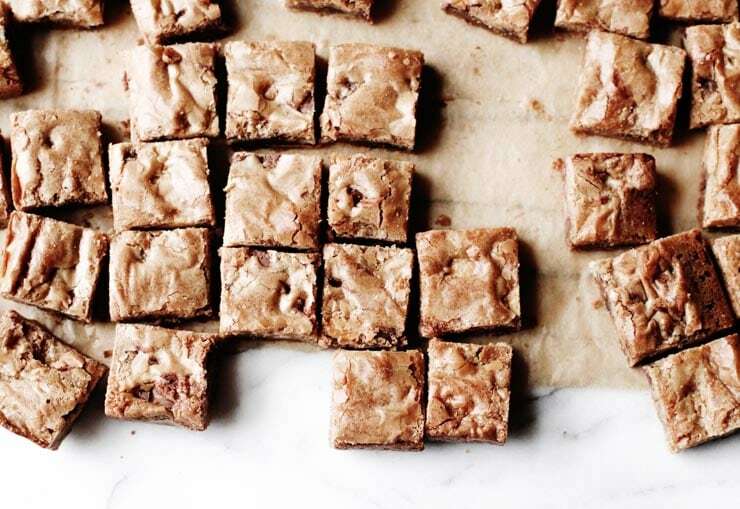 Line an 8-inch/20-cm square baking pan with parchment paper or aluminum foil, leaving an overhang around each side; this will help you get the blondies out of the pan with ease after they’ve baked. In a medium saucepan, melt the butter over low heat. Remove the pan from the heat and with a wooden spoon or sturdy silicone spatula, mix in the brown sugar, vanilla, and salt until smooth and lump free. Quickly stir in the cold egg until well incorporated. 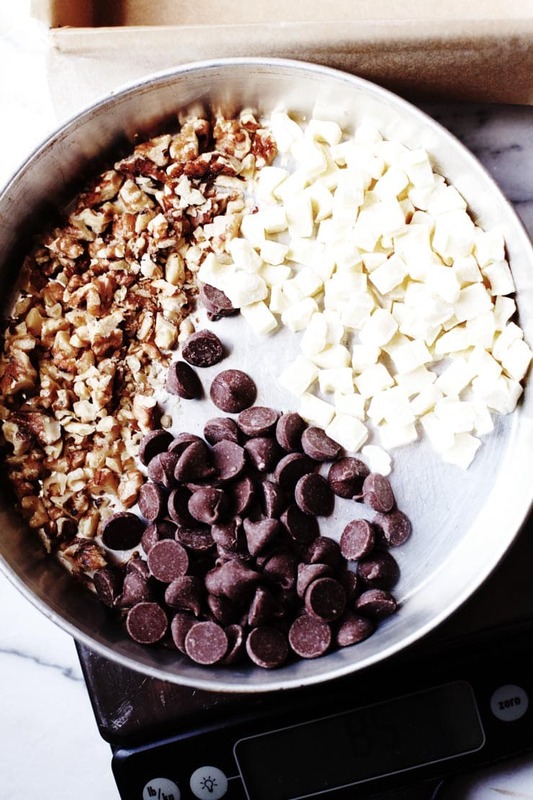 Add the flour, white chocolate chips, milk chocolate chips, and walnuts (if using) all at once. Stir the mixture until just incorporated. Spread the batter evenly into the prepared pan. Bake for 25 to 30 minutes, until golden, set in the middle, and a toothpick or cake tester plunged into the center comes out clean or with a few stray crumbs attached. Allow the blondies to cool completely in the pan (I know, I know; try to wait a bit, though). Once cooled, lift the ends the parchment line and transfer the blondie block to a cutting board. Cut it into 15, 25, or 36 squares. I prefer to err on the side of 36, as these are quite rich, and they’re good for snacking at that size. The blondies will keep in an airtight container, at room temperature, for up to 5 days. Notes: The secret to the moistness of these blondies is the cold egg. If you prefer a blondie that errs on the side of cakey, use a room-temperature egg and briefly beat it with a whisk or fork before adding it to the batter. Once the batter is ready for the oven, tag on a couple more minutes of baking time. I’m so glad you’re loving the site and the blondies, of course! And I love the sound of peanut butter with these; someone actually emailed me a while back about doing a similar thing. Maybe it was you? Thank you so much for the sweet note and the awesome feedback, Renée! Definitely– I’ve several “real food” recipes up my sleeves and I’ll definitely have to share them more. It thrills me so much that you and your husband enjoy the lamb chops that much– isn’t the yogurt sauce fab?! I could put it on just about anything. These blondies are awesome! Now that I’ve found you, I’m drawn back to your site to check for new posts. I am definitely going to make the blondies, maybe with some dark chocolate chunks. Beautiful pictures too! Thank you Nicoletta! These would be perfect with some dark chocolate chunks (trust me, it’s how I mostly make it around here when it’s only for me). Hello Kamran, I made the blondies yesterday, using dark chocolate chunks and 1/3 cup chopped almonds instead of the walnuts. The recipe is easy to follow, and they turned out very good. My only, little “complaint” is the sweetness (but that’s my thing, I don’t usually eat brownies, fudge, Nanaimo bars or any super sweet desserts). If I want to make them again can I reduce the sugar amount without compromising the texture? Thanks a lot and again, lots of compliments for your website! Nicoletta- Almonds and dark chocolate chunks sound amazing in these. You surely could reduce the amount of sugar, but it’d alter the texture and the moistness of the blondies– they’d probably be a little more cakey and slightly drier. I’ve not tried reducing the sugar in these, so I can’t guarantee what would happen, however. For all I know, the reduced sugar one could be quite similar to what they are now; though I think simply reducing the sugar would require other alterations with the recipe, as well. I made these as a little treat for tomorrow. I have never used Maldon salt before but after you mentioned adding a little on top…. I had to find some. I went to gristedes and then whole foods to find it, but it was worth the searching. I’m usually afraid with blondie recipes because they come out really greasy. Wasn’t the case with these. I had one and almost cried because it was so good. Awesome recipe! Would taking away the milk chocolate chips change the texture of the blondie in any way? I want you to know that many of my cooking classes enjoy this sweet treat. I send them your recipe after class. They can’t believe how easy and how delicious they are. It’s a perfect end to a class. The joy multiplies.